The dendrogram in the last post about Eurasian ChromoPainter/fineStructure analysis is a little hard to make sense of, so here is the same info in a better format. Branch3 is mostly the Near East and western Asia. And Branch5 is East Asian. Note that the leaf labels consist of ethnicity followed by the number of that group who belong to that particular cluster. However, some of the labels are cut off in the images since they were long. 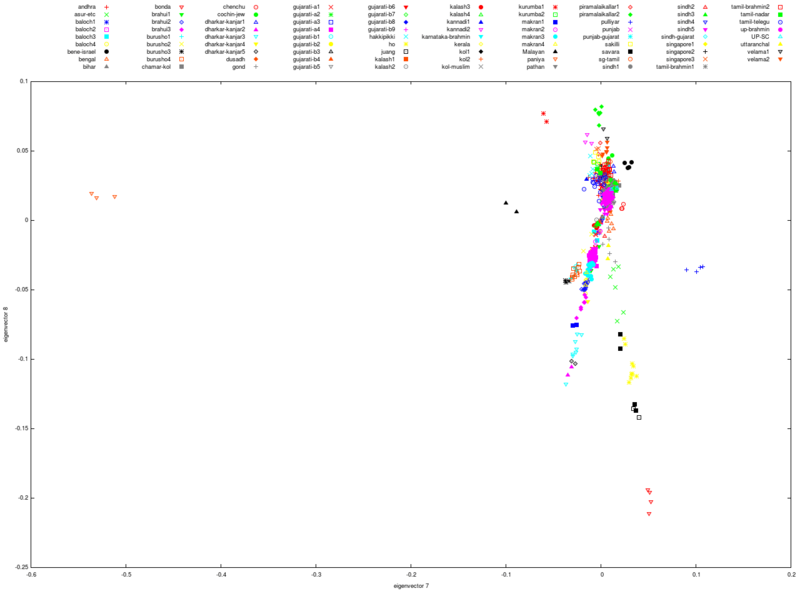 I was wondering what the admixture patterns of the clusters fineSTRUCTURE computed were for my South Asian run. 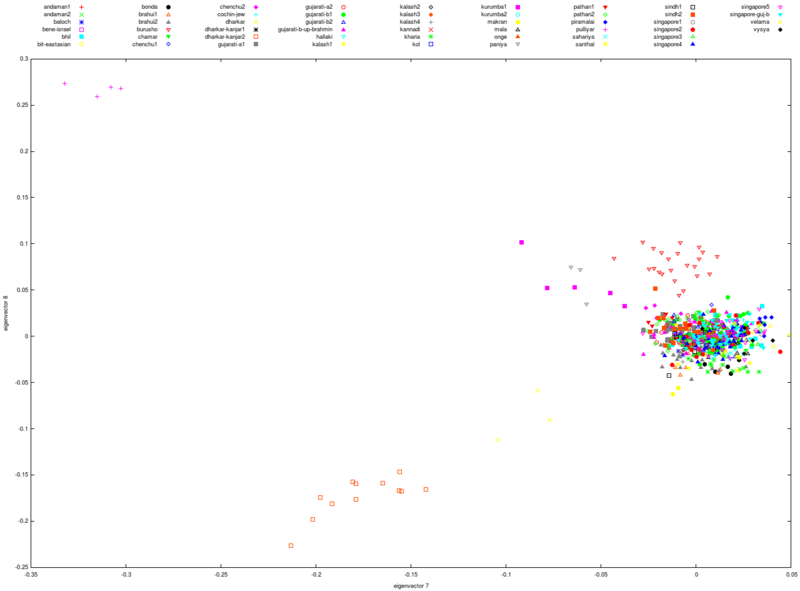 So I computed the average admixture for each cluster (total: 89) using reference 3 admixture results. The default order of the clusters is to keep the closer clusters together. 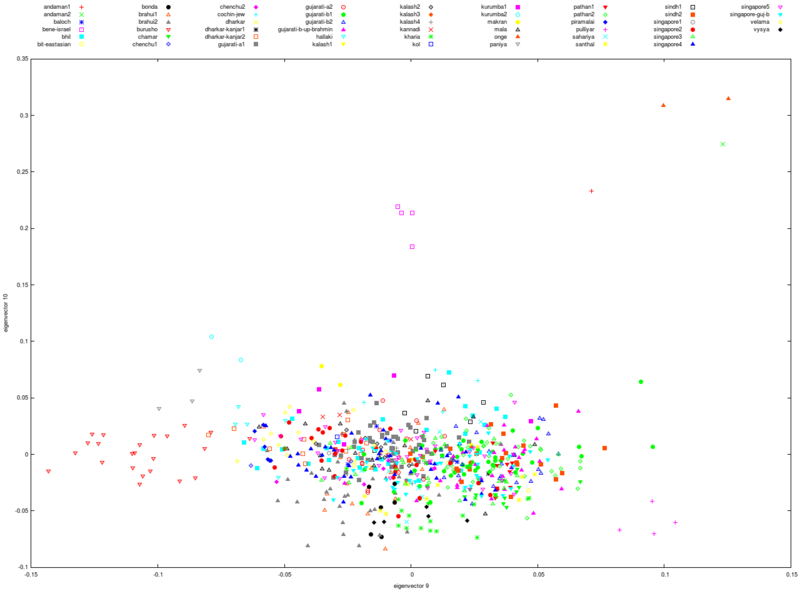 So let's try a dendrogram of all these populations' average admixture results. Instead of using regular Euclidean distance, I used some weighting based on Fst distances between admixture components, very similar to what Palisto did. 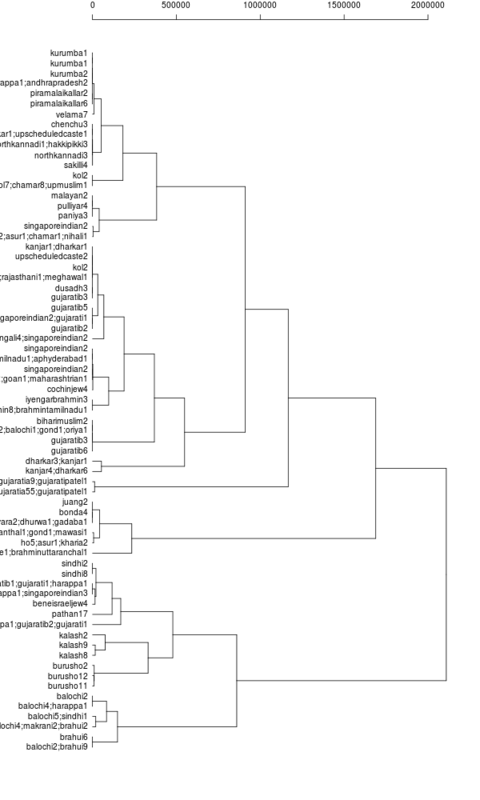 Here's a dendrogram of all datasets using complete linkage. Since the Pan-Asian dataset had only 5,400 SNPs common with reference 3, we need to be careful interpreting the tree above. 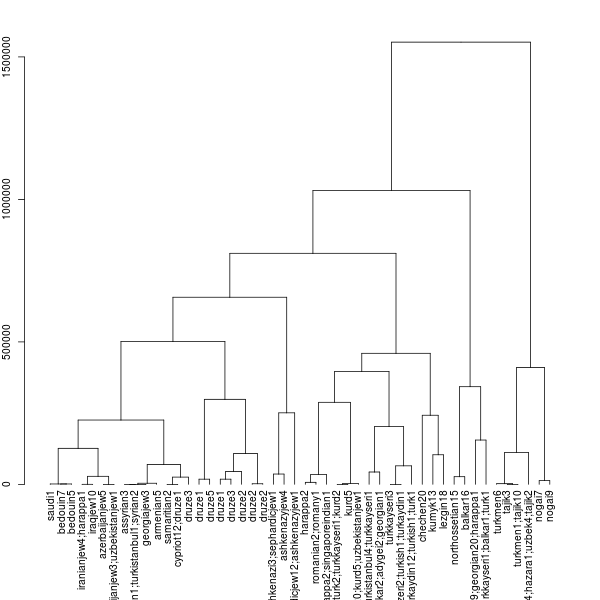 Just to make sure, here's the dendrogram excluding Pan-Asian populations. 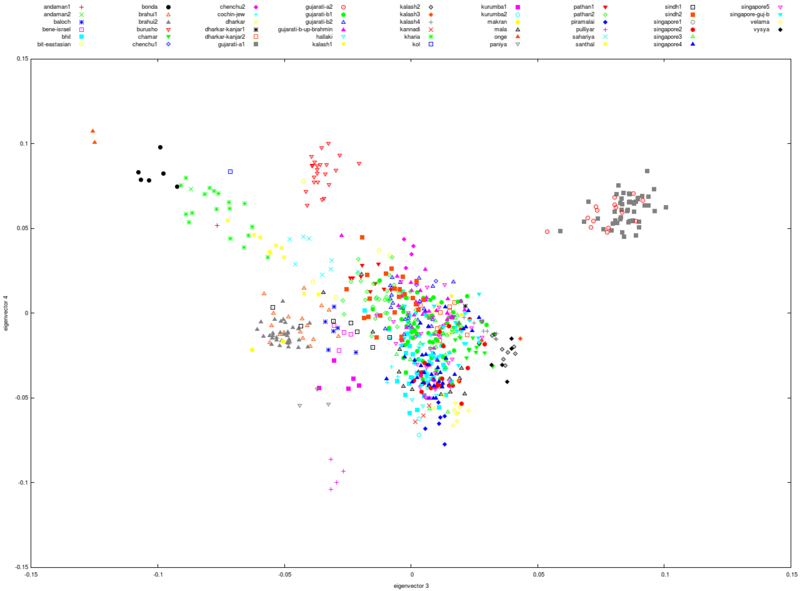 Dienekes ran ChromoPainter/fineSTRUCTURE analysis of South Asians along with some West Eurasian populations, something I had neglected to do in my own South Asian run. However, when we do the same for Pathans, Sindhis, Uttar Pradesh Brahmins, Kshatriyas and Muslims, we get strange results. Do Pathans match Chamar the best? Pathans don't show up as a donor till #11. Again, Sindhis as donors are #12. The same Brahmins_UP_M are #13 as donors. Muslim_M are #8 as donors. There is a pattern here among the top donors for these populations. The same populations show up time and again. If Dienekes can post a chunkcount file for the clusters computed by fineSTRUCTURE, may be we can try to figure out what happened. 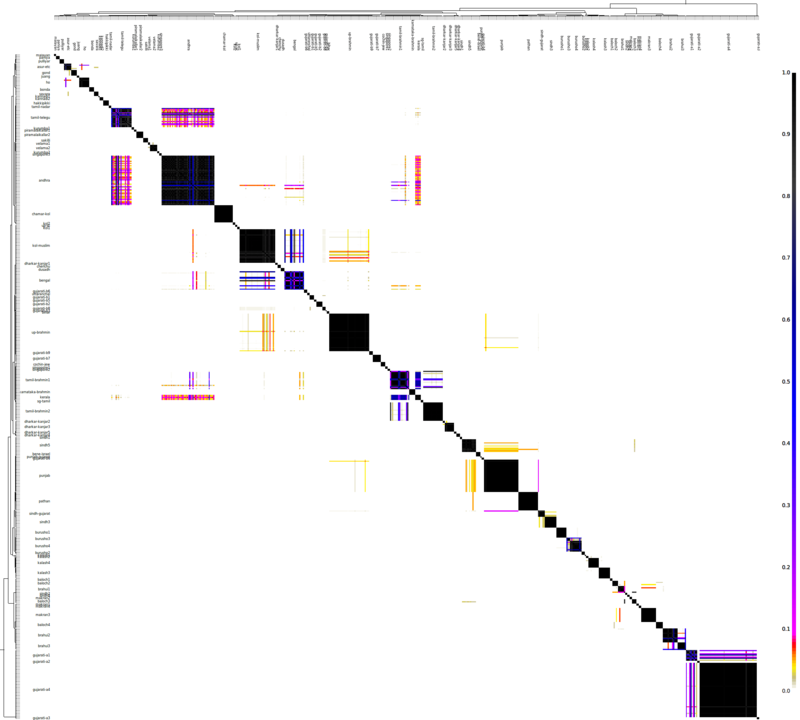 You have probably heard of ChromoPainter/fineSTRUCTURE by now (Eurogenes, Dienekes, MDLP and Razib). So I decided to run the South Asian samples data which I had earlier done PCA/MClust on through ChromoPainter and fineSTRUCTURE. 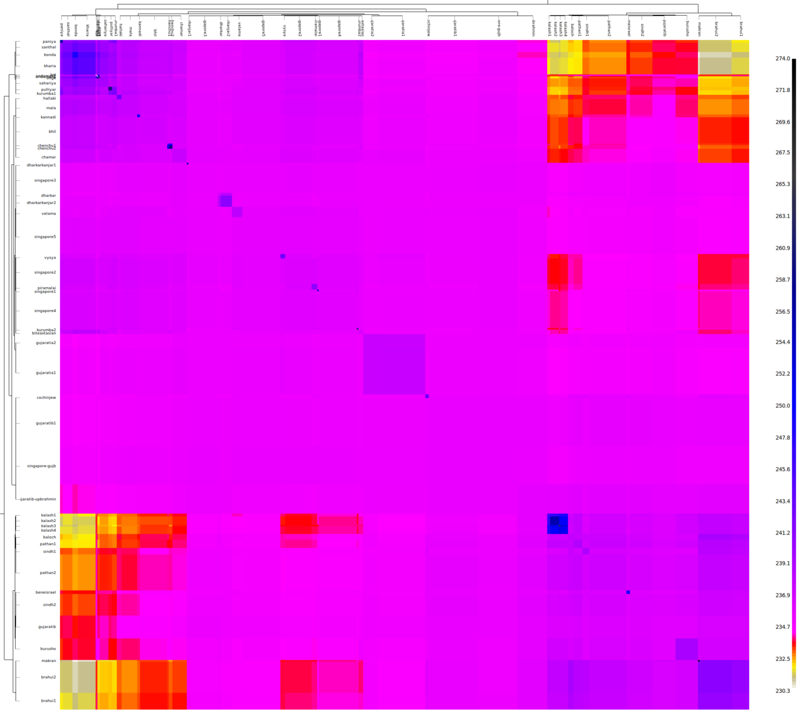 Here is the coancestry matrix among the 715 participants visualized as a heat map. UPDATE: Here's a huge image showing the same. fineSTRUCTURE can use this coancestry matrix to classify individuals into clusters, 52 in this case (compared to 38 using PCA and MClust). You can check the cluster assignments in a spreadsheet. Note that I have named the clusters. That's just a shorthand so we don't have to refer to them by cluster number. Instead I used the population with the largest number of individuals in a cluster to label that cluster. 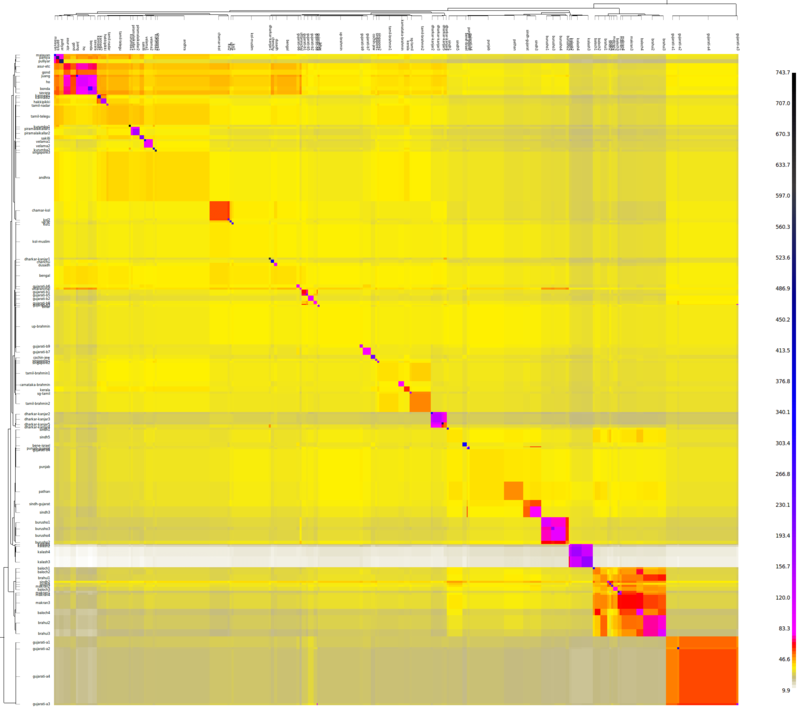 Here's the cluster-level coancestry heat map. 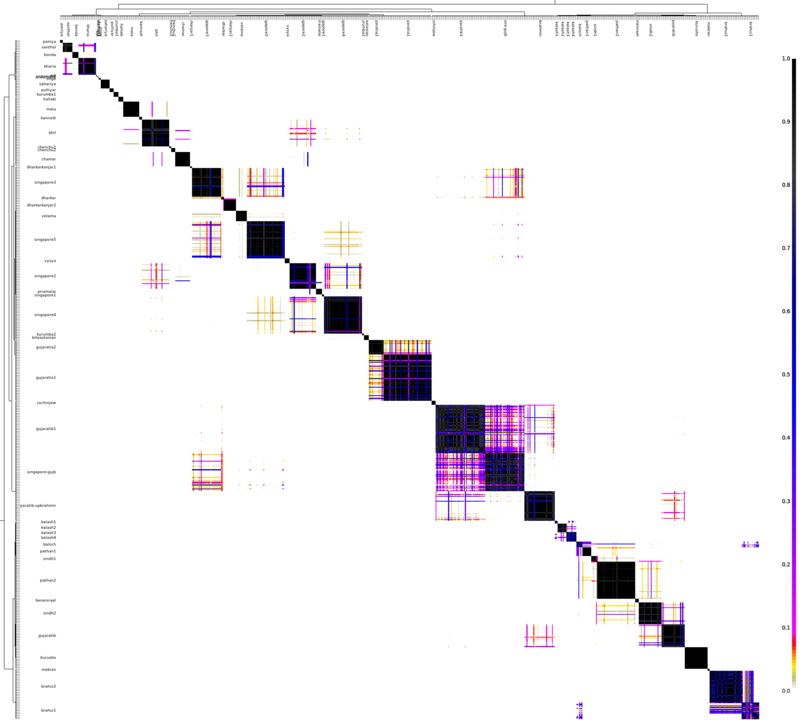 And finally PCA plots for the first 10 dimensions from fineSTRUCTURE. 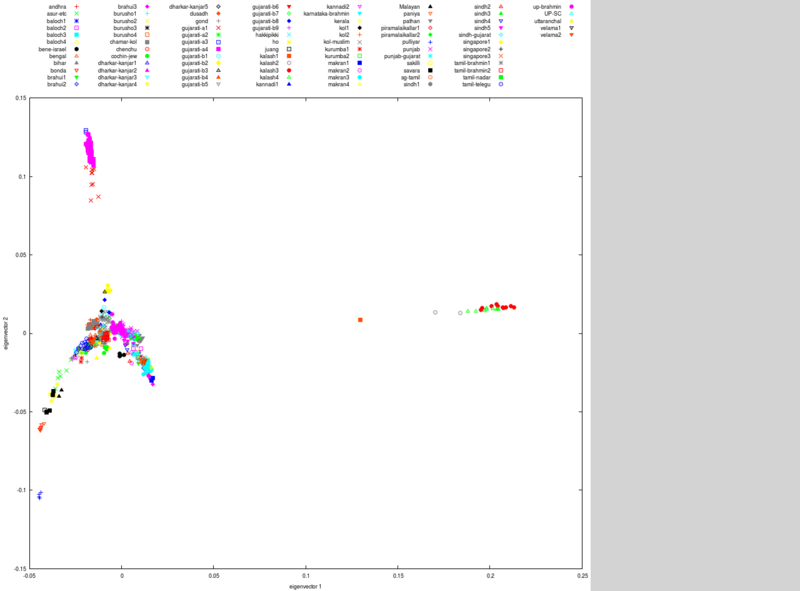 UPDATE (Feb 9, 2012): New PCA plots with better markers for the clusters. Dr. Metspalu, who has been very good about sharing data and information, has informed me about a couple of cases of mislabeling in the Metspalu et al dataset. Our sample labelled D238 and reported as Tharu is in fact a Brahmin sample from Uttar Pradesh. Following the publication we have identified that sample evo_32 was erroneously labelled as Kanjar before any genetic analyses. We hereby re-label the sample as belonging to Kol population. 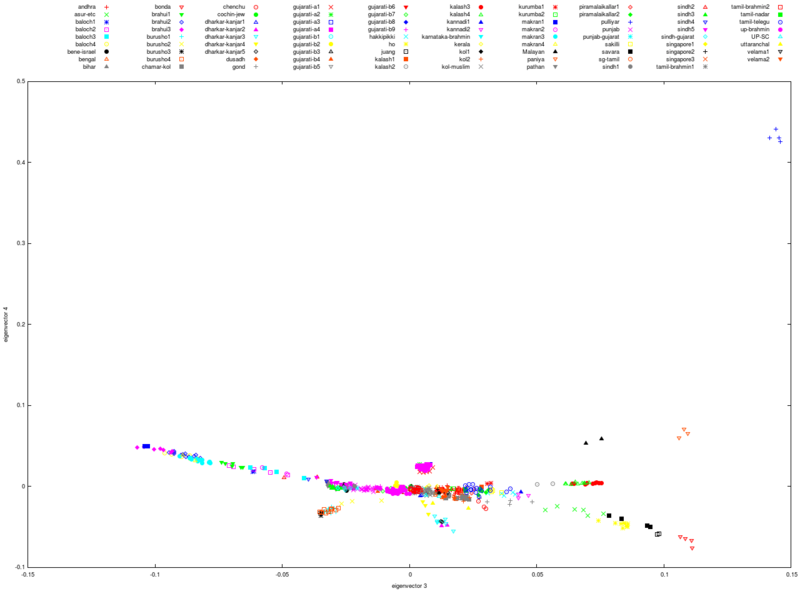 Thus, I have updated the Metspalu admixture results and clustering results. 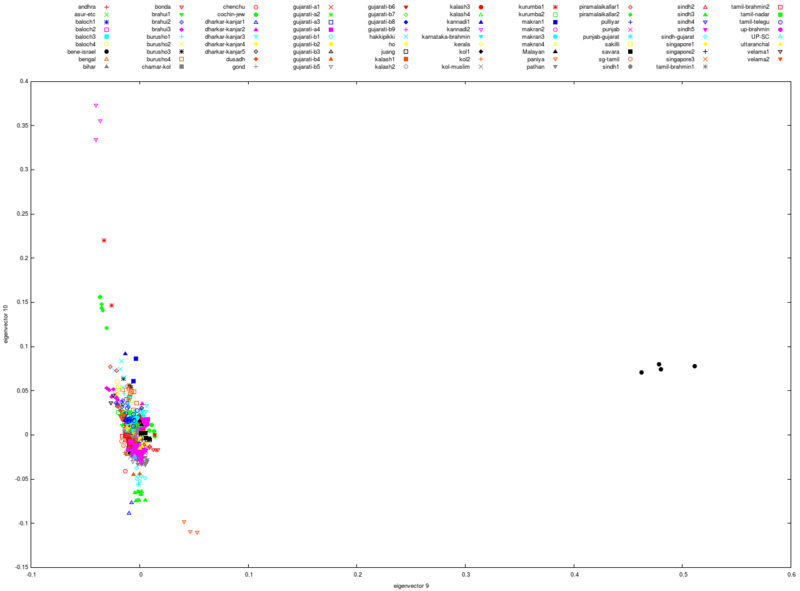 I combined reference 3 with Metspalu et al data and Harappa Ancestry Project participants (up to HRP0200). Then I kept only those individuals whose combined proportion of South Asian and Onge components on my reference 3 admixture results was more than 50%. I ran PCA on these South Asian samples and kept 31 dimensions. Running Mclust on the PCA results gave me 37 clusters. The clustering results are in a spreadsheet. For an individual, the value under a specific cluster shows the probability of that person belonging to that cluster. 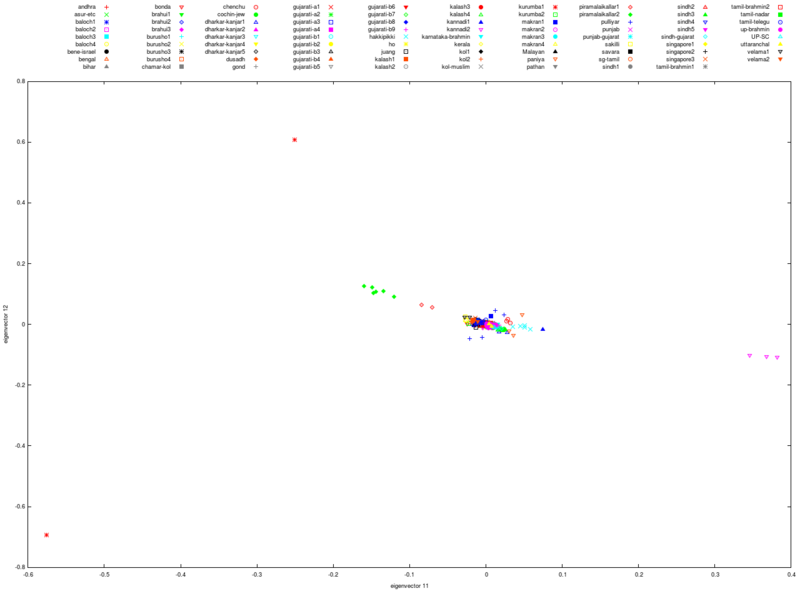 For example, HRP0152 has a 58% probability of belonging to cluster CL8 and 42% probability of being in cluster CL14. For the populations in the first sheet, I added up the probabilities of all the samples in that population to get the expected number of individuals of that ethnicity belonging to a specific cluster. 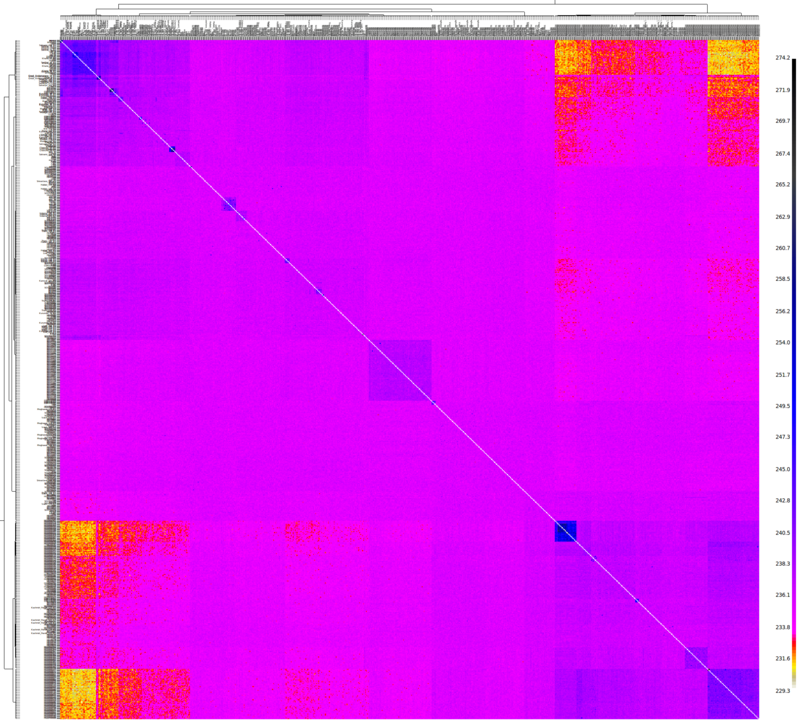 In the second sheet, I have listed all the individual samples' clustering results. There are some outliers who didn't belong in any cluster: HRP0001 (me, of course), 7 (out of 18) Makranis, 4 (out of 23) Sindhis, 3 (all) Great Andamanese, 1 (out of 20) Balochi, 1 (out of 4) Madiga, and 1 (only) Onge. 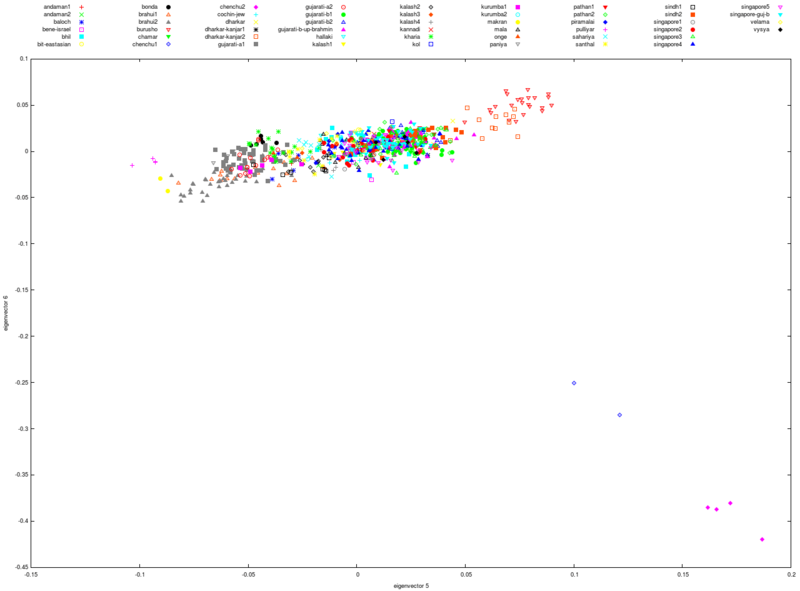 I ran Principal Component Analysis (PCA) on reference 3 along with Yunusbayev et al Caucasus dataset and Harappa Ancestry Project participants (up to HRP0200). Then I ran mclust on the first 70 dimensions. The resulting 156 clusters can be seen in a spreadsheet. 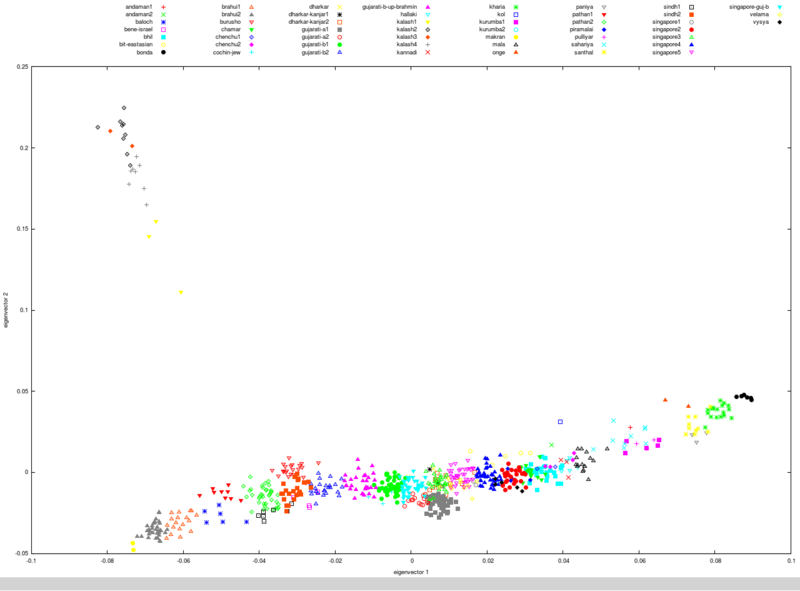 For individuals belonging to Harappa Ancestry Project, the value in a column shows that person's probability of being in that cluster. So if there is a 1 in CL15 for example, then that person has a 100% probability of being in Cluster CL15. For the reference population groups, I have added up the probabilities for all the individuals belonging to that group. 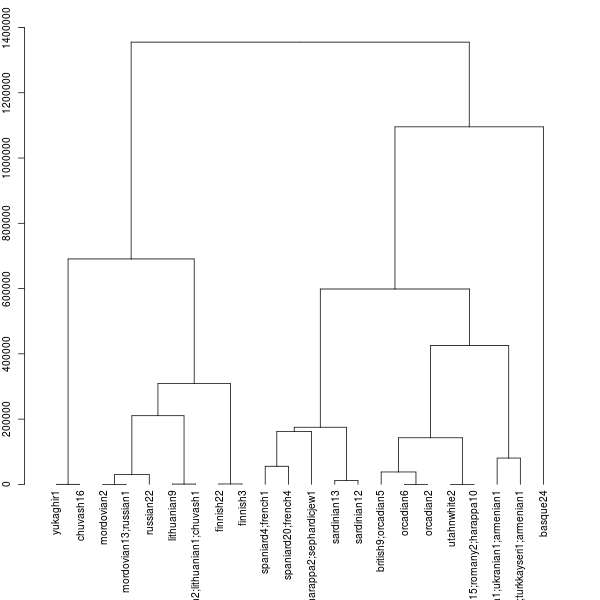 I haven't done any admixture dendrograms in a while, so I thought you guys might be interested.Особенности национального строительства. Стены помещения. 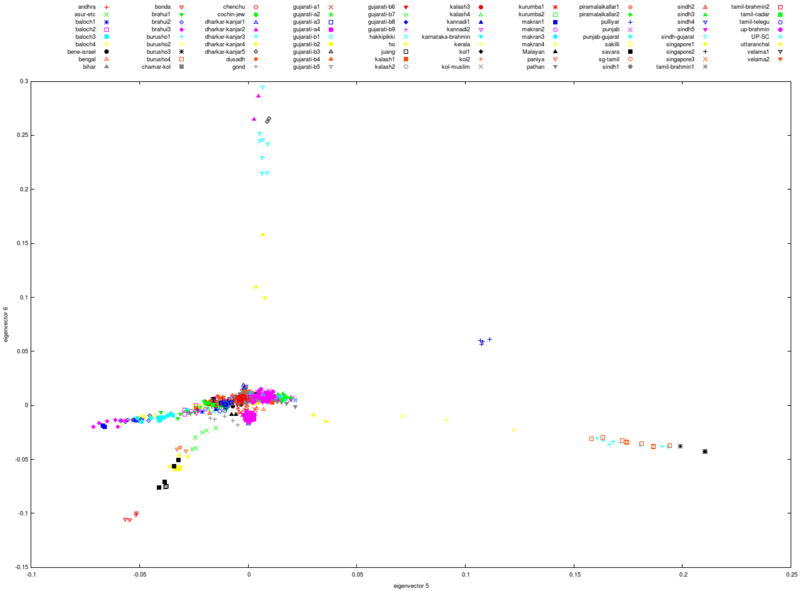 This uses admixture results using Reference 3. 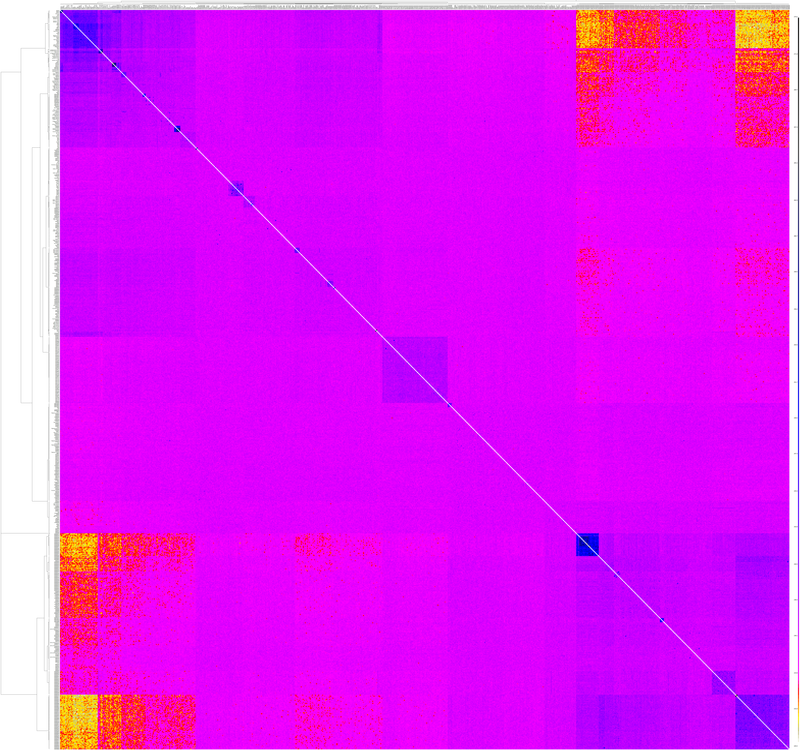 As usual, I used complete linkage for the hierarchical clustering. 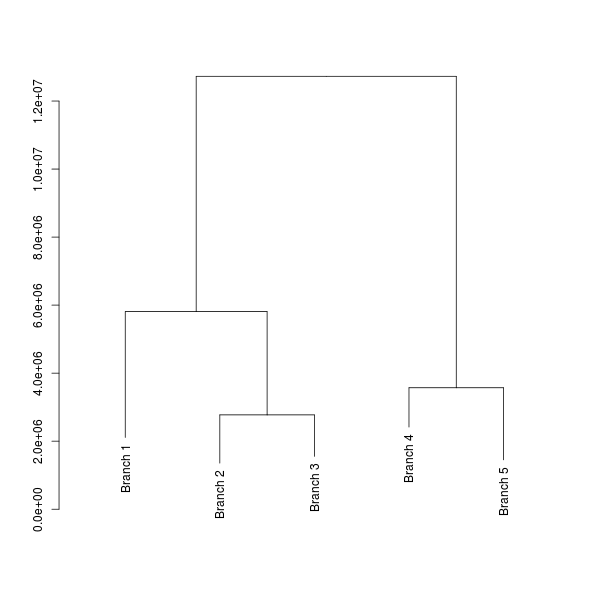 Let's look at the dendrogram using regular Euclidean distance measure between admixture results. I also decided to use chi squared distance measure to do the clustering. PS. Any thoughts on the trees based on two different distance measures?